Gana Fill PLLA is an alternative filler that works subtly and gradually over time for a more youthful-looking appearance. Unlike typical hyaluronic acid dermal filler in the market, Gana Fill helps stimulate your skin’s own natural collagen production to help restore its inner structure and increase facial volume that has been lost to aging. 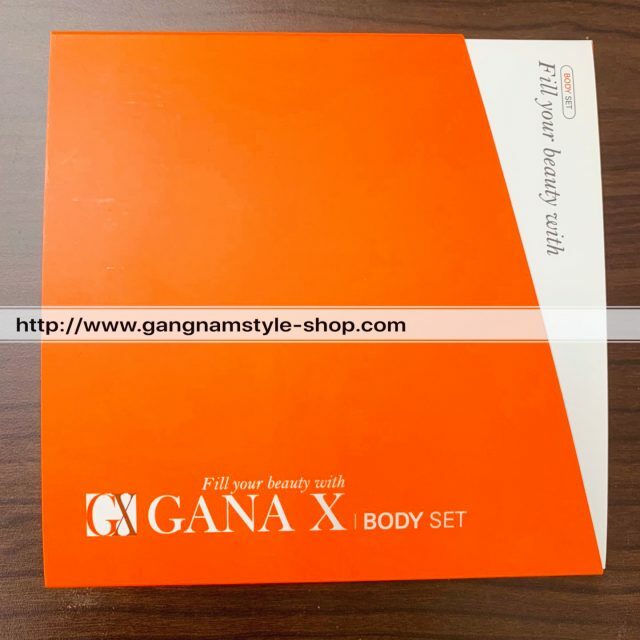 Gana Fill intended for use in people with healthy immune systems as a one-time treatment regimen of up to 3 injection sessions that are scheduled about three weeks apart. Gana fill is made of PLLA Poly(L-lactide), PLLA is FDA approved material which is safe to use for cosmetic purpose. Gana Fill is CE certificated and KFDA approval. What is Gana Fill PLLA filler? Poly(L-lactide) is a biodegradable material with good bio-absorbability and bio-compatibility. After degradation in the body, PLLA products are excreted by metabolism and thus has no harmful side effects to the human body. 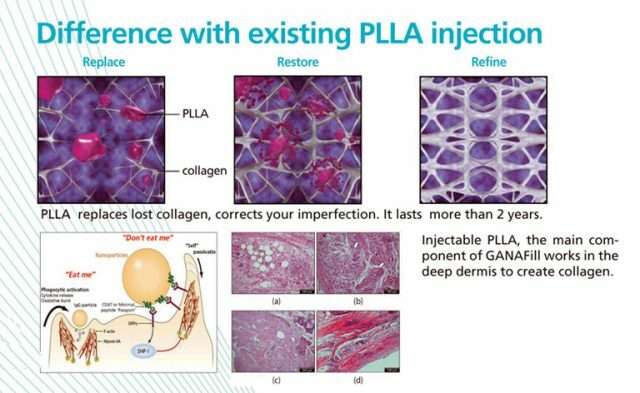 It is for these reasons that PLLA products are currently widely used in the field of medicine, such as for one-time infusion equipment, medical surgical suture, drug delivery carriers, tissue engineering scaffolds, bone anchors, injectable microcapsules, microspheres, implants, elastomer materials for organ support, etc. PLLA is a Collagen stimulators which is used to diminish facial wrinkles by helping to restore the deep, underlying structure of the skin. Collagen is a key structural component of smooth, healthy-looking skin. As you age, your body’s collagen production decreases. In fact, you lose about 1% of collagen per year after the age of 18. This is when you may start to notice the formation of wrinkles. Luckily, Gana Fill can help, even if decades of collagen loss have already occurred. Gana fill helps gradually replace lost collagen — an underlying cause of facial aging — for results that can last more than two years. 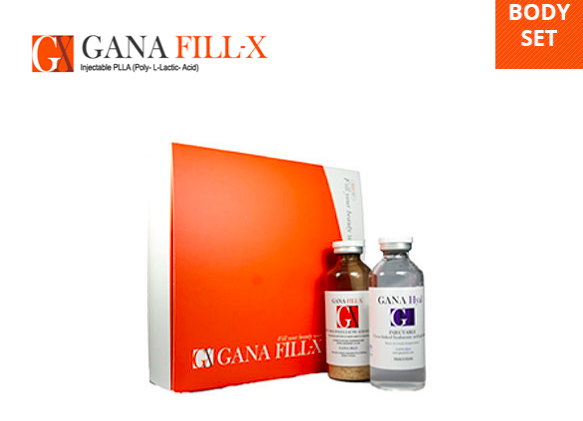 As a poly-L-lactic acid (PLLA) collagen stimulator, Gana Fill is different. It works with your body within the deep dermis, rather than topically, to help revitalize collagen production and help restore your skin’s inner structure and volume. 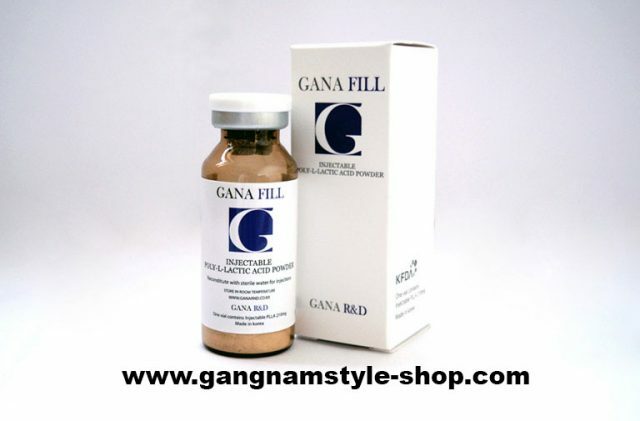 The Gana Fill face filler is made from a mixture of PLLA powder FDA approved materials. GANA FILL PLLA is more innovative and creative than all existing PLLA products in the market. It induces the formation of collagen which in turn has the effect of increasing volume of the part where the surgical procedure was done. The augmentation will continue until the 8th week and will last for 2 years after the procedure. Main areas of use with Gana Fill face are temple, cheek, itt uses the same main ingredients as Sculptra but contains more PLLA in mg. This GANAFILL X contains large amounts of PLLA 1560mg PLLA and a 40cc of Hyaluronic Acid. GANAFILL X is made for body augmentation. Breast ,hip, male and female genital organ. It works better with the hyaluronic acid when inject on the body. This entry was posted in gana fill, PLLA, Poly L-lactide and tagged gana fill, plla, Poly L-lactide.